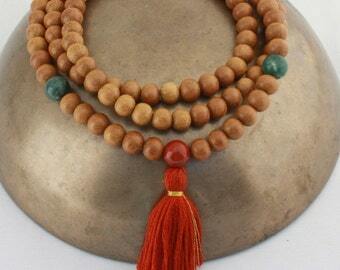 This red aventurine mala with carnelian also includes red agate and serpentine. It brings the "I can do it" spirit to one's meditations. Red Aventurine works with determination, strength, creativity, and alignment with one’s highest path. It increases ones desire to take on and overcome the challenges of life. It helps those who must work long hours to focus. It assists with physical energy, especially for those overcoming illness and may bring new inspiration to those who work creatively. Carnelian is helpful for confidence, and agates work with stability and grounding. Serpentine is ever-so-helpful with connecting with nature and rousing the kundalini energy. 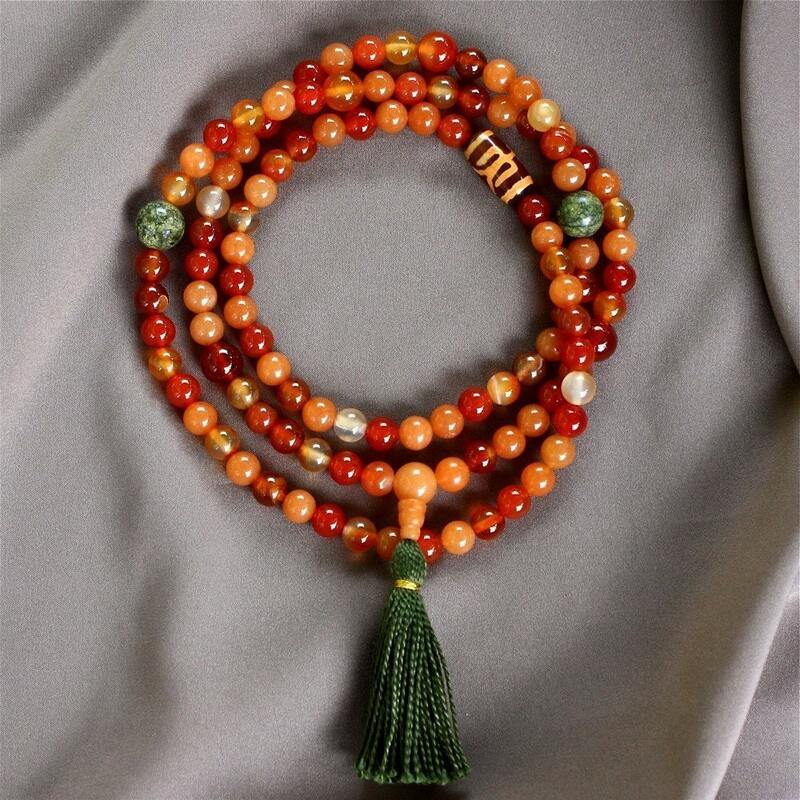 There are 106 8mm red aventurine mixed with carnelian and red agate, one large Tibetan agate, two 12 mm serpentine beads, and two 10 mm carnelian beads. All strung on durable nylon-coated beading wire (that coils softly) and finished with a three-holed guru bead. No two of this style will be exactly the same, due to variations in the stones. The Tibetan agate (Dzi) comes in a couple of different patterns. The tassel is hand made from green cotton thread. Strung with love and best wishes! Happy to ship worldwide. See store policies for more details. These mandala beads are so very beautiful and are really strong and well made. I love them!